(Jon Wiener) We’re spoiled in Mississippi when it comes to college baseball. Over the years we’ve seen the best the sport has to offer — none more so than Mississippi State center fielder Jake Mangum and Ole Miss coach Mike Bianco. Mangum became the all-time hits leader at Mississippi State this past weekend in the series win over Tennessee and is chasing the SEC record. Bianco won his 300th SEC game at Ole Miss to start the Rebels’ sweep of No.16 Florida — sixth all-time in the SEC. Mangum has been nothing short of a super stud since his arrival at Starkville when he led the conference in hitting as a freshman. Bianco has done nothing but win in Oxford, turning a dormant program into a powerhouse. Both have led teams to SEC championships and Omaha appearances and the respective faces of the program: Mangum has been around longer than each of the last three Bulldog head coaches. Bianco has been the one constant through the Rebels revolving door of talent for nearly two decades. If either can win it all before they’re done, you ought to start sculpting the statue. (Joe Simeone) A table-turning weekend for Ole Miss: the Rebels have struggled at times this season, but they put together an important sweep of No.16 Florida this weekend in Oxford. The Rebels offense exploded for 40 runs across the three games (coming back from 8-0 in one) to break out the brooms on the Gators. They’re now tied atop the SEC West at 8-4 with consecutive series wins, and all is well in Oxford. Overcoming newfound adversity: Mississippi State was coming off their first series loss at home to LSU last weekend, and faced a good Tennessee team on the road. They won in extra innings in Game One, and lost the second 2-1 on a fluky mental mistake from pitcher Peyton Plumlee that allowed two runs to come across on a dead ball rule. The rubber game saw star freshman pitcher J.T. Ginn pulled after only two innings, and State had to grind out a comeback 7 – 5 win. State had dominated all season before the LSU series; they’ve now shown they can win the hard way. Comeback kids in Hattiesburg: Southern Miss opened the weekend up with a 10-3 win on the back of a complete game performance from starter Walker Powell. 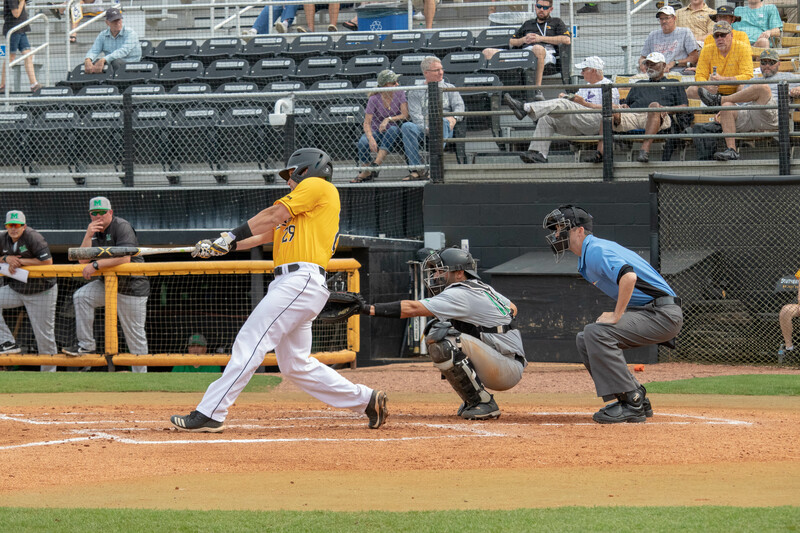 The doubleheader on Saturday was not as easy: USM walked it off on a single from their hottest hitter Bryant Bowen to win the morning affair 4-3. Then the Golden Eagles found themselves down 10-5 in the bottom of the 6th of the third game. But they battled right back with their litany of bats to secure the sweep over Marshall. Southern Miss (20-9, 10-2) continues to cement themselves as the top team in C-USA baseball. 3. Grove Bowl Bears Fruit? (Joe Simeone) For all you football fans craving attention, spring football games are finally here! Ole Miss got things kicked off this weekend in the Grove Bowl, where the offense and defense faced off against each other in the glorified scrimmage. While you may be watching the players and their stat lines, the important story to follow is the coaching staff on the sideline. Heralded new offensive coordinator Rich Rodriguez is getting a chance to implement his system for the first time this spring. So it was a chance for players to make a statement for their new offensive coordinator in a ‘game-like setting,’ and cement themselves as frontrunners for starting spots. None moreso than former Pearl star Tylan Knight. Knight played a swiss-army-knife of roles as a true freshman, but debuted as a slot receiver in the Grove Bowl and was a flat-out head-turner. But it was defensive coordinator Mike MacIntyre’s new 3-4 defense that took home the win in the intrasquad scrimmage. Mississippi State, Southern Miss and Jackson State will all kick off their spring football games this Saturday. We’ll be sure to have a watch and a couple of takes! 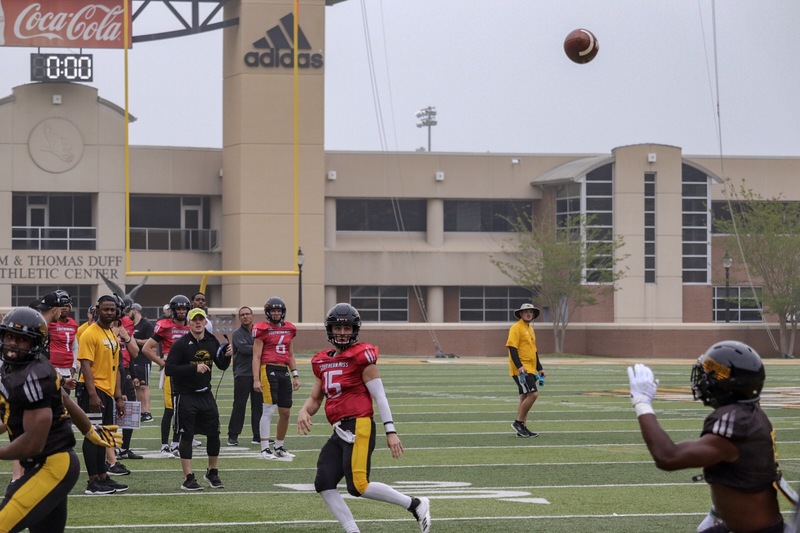 Southern Miss QB Jack Abraham flicks one into the endzone during practice. (Jon Wiener) There’s another women’s team deserving your attention in Mississippi. The Ole Miss Rebels softball team is crushing it again and well on their way to a fourth straight NCAA appearance — the impending fourth in school history. The Rebels just won a series at No.22 Kentucky to move to 27-10, 7-4 in the SEC. It’s a salty group that’s learning to play with the big-time best: Ole Miss already has 10 wins versus ranked teams this season, more than all of last year. When coach Mike Smith took over, the program had mustered just two winning seasons in eighteen years; Smith has shattered the ceiling and rapidly built the program into one of the best in the SEC. As in most sports, that also means one of the best in country. The Rebels are currently ranked No.11 in the country by the most recent poll — good for fifth best in the conference. Like women’s basketball, softball is becoming a bigger deal every year in the SEC and in Oxford. Here’s to a long postseason run for the Rebels! (Jon Wiener) It’s a tradition unlike any other: getting your Sunday morning round in on the overcrowded course to get home for the Masters final round. There’s nothing that makes you want to get out and play quite like watching the Masters on a sunny day, so we advise getting a celebratory round in early, wherever you can. We also recommend putting vodka in your Arnold Palmer and call it a John Daly. Looking for some SEC flavor? Alabama great Justin Thomas comes in at 16-1, not on form but always a threat. Two-time winner and former Georgia Bulldog Bubba Watson checks in at 25-1. Like Thomas, he hasn’t played his best golf lately but has the shots and swagger to factor. Then there’s defending champ and ex Georgia Bulldog transfer Patrick Reed (60-1), whose soap opera personal life has escalated while his game has gone A.W.O.L. Reed knocked out Rory McIlroy and held off Rickie Fowler to win a year ago, but it would be all the more surprising to see him contend this year. Check out Play It Where It Lies: Masters edition for the full Masters preview experience. Marshall Henderson reference during Auburn’s Final Four game. Drink the whole. #%*. bottle.